Expert sleepers announces the Universal Binary version of Crossfade Loop Synth Audio Units for both Intel-based and PowerPC-based Macs. Crossfade Loop Synth is a simple sample playback synth plug-in. It plays samples in the classic sampler manner - by simply altering the playback speed according to the desired note. No fancy timestretching or pitchshifting is applied. This shareware is available in our siftware section. You must be logged in as a registered member to use this feature! Dec 17, 2004 Two channels into one ! Pro Tools First for Free! Add dynamic content to your own site for free. By inserting some simple HTML code in your pages, you can easily publish MacMusic news on your web site. Your visitors could then immediately link to the news which is updated daily. 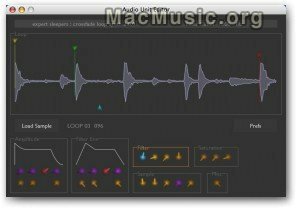 This MacMusic section is managed by d-cipher with the help of the translators team.